Japanese photographer Shigeo Anzaï has spent his career documenting artists and their work in Japan and internationally for over four decades. Many of these artworks now exist only through reconstruction or in Anzaï’s images. A recent exhibition curated by Edward Ball at the White Rainbow gallery in London presented a wide selection of photographs from Anzaï’s archive, providing an exhaustive record of the Japanese avant-garde scene of the 1970s.1 Exploring the photographer’s role as a witness, the exhibition presented rare images taken by Anzaï while working as an artist assistant at the 10th Tokyo Biennale, a crucial exhibition that set Japanese conceptualism within a wider international context. The exhibition represented the culmination of two decades of experimentation in Japan, which had seen the rise of Gutai, anti-Art, non-Art and Mono-ha, and attempted to show a continuity between these practices and art movements developed in the West, underscoring shared interests in exploring the boundaries between art and life, acting and being. Creative exchanges between Japanese and North American and European artists had regularly occurred since the 1950s, and in the 1960s Japanese institutions began to forge links with the art world abroad, particularly with US artists and museums.6 The 10th Tokyo Biennale furthered such international ambition by affording many foreign artists the opportunity to work in situ.7 Nearly half of the artists included in the project had participated the year before in ‘When Attitudes Become Form (Works – Concepts – Processes – Situations – Information)’ at the Kunsthalle Bern and/or in ‘Op Losse Schroeven (Situations and Cryptostructures)’ at the Stedelijk Museum in Amsterdam8 – two shows that Nakahara refers to as direct influences in the exhibition catalogue, together with ‘Anti-Illusion: Procedures / Materials’ (1969) at the Whitney Museum in New York.9 Nakahara also travelled elsewhere in Europe and, notably for the time, included artists from Poland and former Czechoslovakia. In 1970 Anzaï had yet to travel overseas,10 and had just recently started to take photographs, supposedly taking on board a suggestion from Japanese artist and theorist Lee Ufan.11 The 10th Tokyo Biennale marked a breakthrough in his career, which would later take him to photograph the 42nd Venice Biennale (1986) and documenta 8 and IX (1987 and 1992) in Kassel. 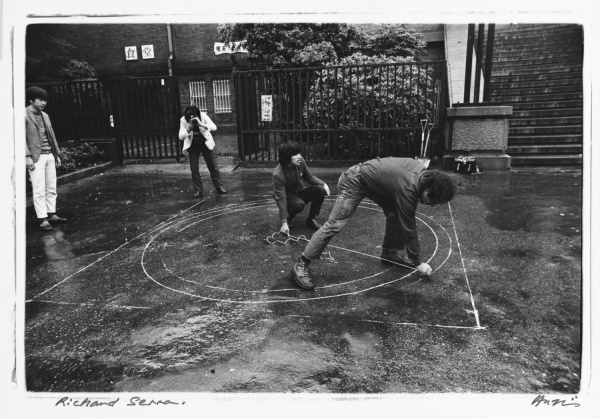 Having been asked to assist Carl Andre, Daniel Buren and Richard Serra during the installation of the biennial, he began to photograph these and other artists in the process of producing site-specific artworks. Working at a time when artists were increasingly adopting time-based and process-led approaches, Anzaï considered photography as a means to document ephemeral and site-specific interventions, capturing the immediacy of the moment. 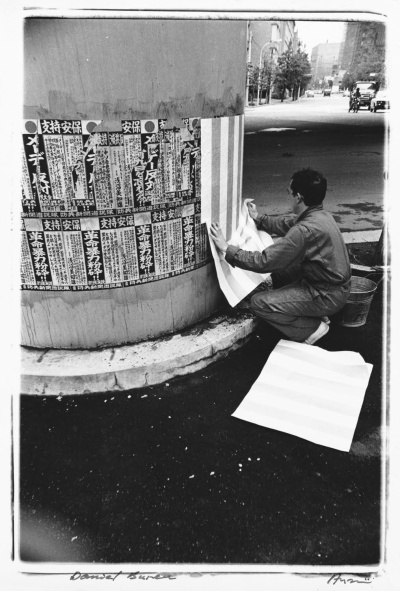 His photographs are a precious record of seminal moments in Japanese art. On their own, however, the images of the 10th Tokyo Biennale on view at White Rainbow offer a biased view of the exhibition in as much as they focus on work produced by international artists, with the important exception of Jirō Takamatsu. Mono-ha, literally ‘the school of things’, is a term used to describe the practice of a group of artists working in Japan in the late 1960s and early 70s who mainly used natural raw materials such as charcoal, stones, wood and soil, arranged with minimal artistic intervention.14 Placing emphasis on materiality and temporality, their aim was to investigate the presence of the ‘thing’ in relation to its surroundings, and create the balance necessary to confer meaning to matter. 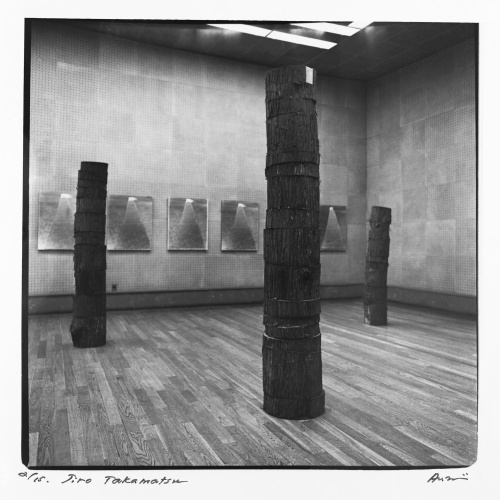 For the 10th Tokyo Biennale, Takamatsu installed works from his Oneness series, such as Sixteen Oneness and Thirty-six Oneness (both 1970).16 The latter, depicted in Anzaï’s photograph, was composed of several cedar logs, cut and then reassembled, showing the manipulation of the material. Exposing the artistic process, the artist turned gesture and technique into the artwork itself. While Anzaï went on to become one of the foremost photographers of Mono-ha, this is one of the few photographs he took of the Japanese artists’ participation in the biennial. In the exhibition catalogue, Nakahara explains that he considered the museum as a ‘matrix’: rather than a space for art, the museum was a place or a situation for its experience. According to his ‘theory of presence’, the site where the artworks were situated had developed into an integral aspect of the relationship between man and matter.18 It was therefore important for Nakahara to enable international artists to produce work in response to the local environment. In total, seventeen artists travelled to Japan to install their work, and many had to adapt their projects to what they found in situ. Anzaï’s pictures remain an important document of that process. A case in point is Christo, who originally planned to cover the walkway of Ueno park. 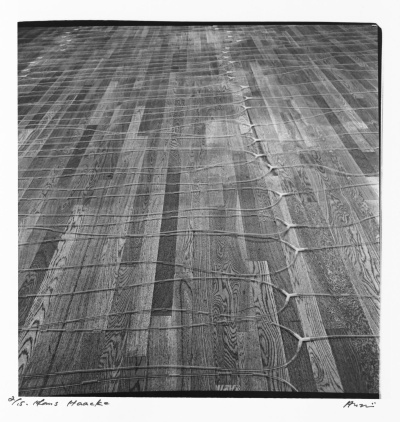 Having failed to get permission, he decided to instead repeat Wrapped Floor, a piece that he had installed at the Wide White Space Gallery, Antwerp in 1969, and at the Philadelphia Museum of Art in 1970. In Tokyo, Christo was allocated a vast exhibition gallery featuring a monument that he was told not to wrap. He draped fabric across the entire room nonetheless, and was soon asked to comply with the organisation’s demands. 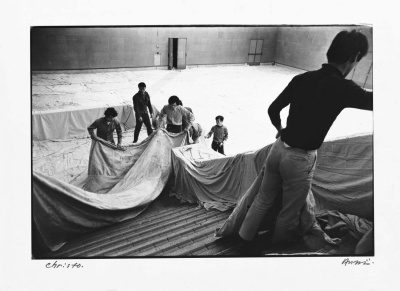 Anzaï’s photographs capture Christo at work, lifting fabric from different angles with the help of assistants, showing the collaborative aspect of the installation. Anzaï describes his own mode of production as ‘not going straight to the artwork but keeping a distance’, developing a perspective that put him ‘on the side of the artist’.19 People who know him praise his ability to earn the trust of the artists, claiming that this allows him a crucial insight into their work.20 It was by building a relationship with the artists at work in the 1970 Tokyo Biennale that Anzaï was able to witness history as it happened, seizing it for future viewers. 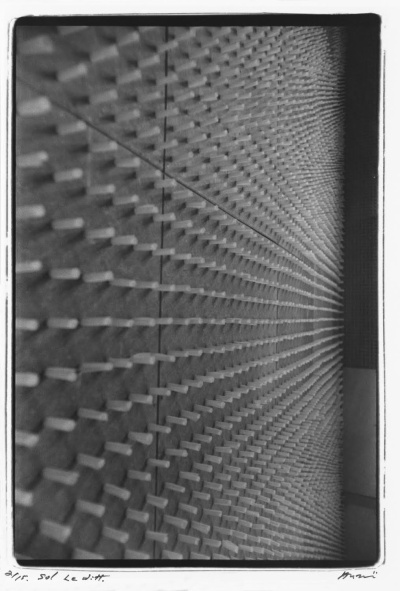 Wall Drawing 38 is the only ‘drawing’ conceived by Sol LeWitt that employs a pegboard-and-tissue technique. The artist initially intended to paint the original walls of the gallery but having been denied permission and instead provided with a room made of artificial walls, he proposed an alternative to his iconic Wall Drawing. The documentary photographs of LeWitt’s and Haacke’s work constitute exceptional moments in Anzaï’s production. Here Anzaï opted for a close-up approach that, when compared with most of his installation photographs, sacrifices contextual information in favour of a dramatic representation of materials, texture and composition. Anzaï captured Daniel Buren on the move. Having been denied permission to paste his iconic stripes directly onto the walls of the Tokyo Metropolitan Art Museum, the artist decided to paper the streets around the museum instead. This series of photographs – six in total – record the spontaneity of the moment, showing Buren running around with a bucket of glue and a roll of paper. The 10th Tokyo Biennale was tepidly received in 1970 but its popularity has grown ever since.24 Little critical material is available in English, and much of it is based on anecdotal and testimonial evidence, leaving many questions open, such as: What happened to the exhibition’s emphasis on process when it travelled to other venues in subsequent months?25 To what extent did Nakahara’s curatorial methodology allow for meaningful exchanges amongst international artists? How did the encounter between Japanese, European and North American artists inflect their practice? While Anzaï’s photographs cannot address these questions on their own, they are a vivid reminder of the exhibition’s significance and the need to continue to unearth its contribution to the history of contemporary art and its exhibitions.